The brain scan of a fossilized monkey skull has given evolutionary anthropologists new clues into the branching of humanity's ancient origins and is rewriting the current understanding of primate brain development. 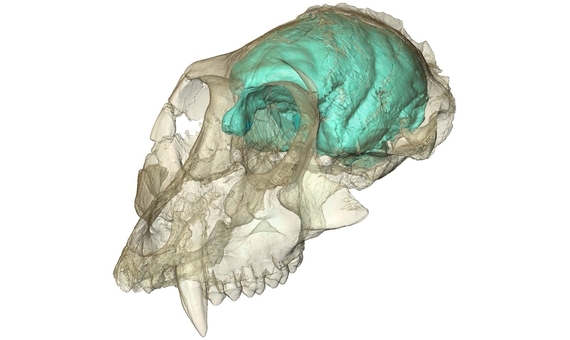 A team from Duke University scanned this ancient monkey fossil, first discovered in Kenya in 1997, and has revealed that its tiny brain was wrinkled and well defined, containing aspects that are actually more complex than its modern descendants. The ancient monkey, famously known as Victoriapithecus, is from the Old World primate family- an evolutionary branch that contains animals such as macaques and baboons. This specimen is believed to be 15 million years old and was first discovered in Kenya's Lake Victoria. The team at Duke University, lead by Lauren Gonzales, used Micro-CT scans of the skull to show the brain's size in relation to the body. Researchers calculated the brain volume to be 36 cubic centimeters, which is less than half the brain size of modern monkeys. Despite the small cerebral size, the brain of Victoriapithecus was shockingly complex. Alongside the numerous wrinkles and folds, the team's CT scans revealed that the brain's olfactory bulb -- the area of the brain that analyzes smell -- was three times larger than expected. "It probably had a better sense of smell than many monkeys and apes living today," Lauren Gonzales stated in Nature. "In living higher primates you find the opposite: the brain is very big, and the olfactory bulb is very small, presumably because as their vision got better their sense of smell got worse." The large olfactory bulb leads researchers to believe that Victoriapithecus could have retained both capabilities. This discovery has provided new clues to early primate development and cognitive function, with a new examination on the emergence of brain complexity versus brain size. With little physical fossil evidence on Old World primates, clashing opinions on which came first continue. "In the part of the primate family tree that includes apes and humans, the thinking is that brains got bigger and then they get more folded and complex," Gonzales stated. "But this study is some of the hardest proof that in monkeys, the order of events was reversed -- complexity came first and bigger brains came later."